Caption: The finished honey-roasted Brussels sprouts. This dish can be served as an appetizer or as a side dish for your favorite meal. Place Brussels sprouts in a roasting pan. 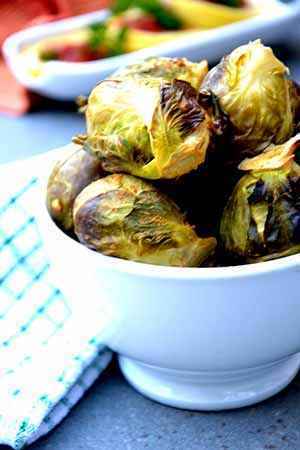 Pour 2 cups brewed green tea over Brussels sprouts, then drizzle with honey. Place into the oven for 30 minutes; flipping sprouts after 15 minutes to ensure even cooking. Meanwhile, in a medium sized bowl, combine remaining ingredients; mix until well combined. Set aside. Remove Brussels sprouts from oven; drain remaining liquid. Transfer sprouts to a serving bowl. Serve warm with a drizzle of almond sauce. It makes being on a celiac diet not so bland. Puts a little zest into the flavor of normal healthy foods. Sounds good, however green tea (mentioned in the directions) is not an herbal tea; it is a caffeinated tea. I noticed the same thing about the tea. So I hope the author can specify whether she means herbal tea or green tea. Amie Valpone, HHC, AADP is a Manhattan based Personal Chef, Culinary Nutritionist, Professional Recipe Developer and Food Writer specializing in easy Gluten-Free and Dairy-Free recipes. Amie is the Editor-in-Chief of the gluten-free blog, The Healthy Apple. Amie shares her passion for and approach to "Clean Eating" by focusing on natural, whole foods and ingredients that are good for you and your body. Amie works with Whole Foods Market as their Gluten-Free Manhattan Cooking Instructor and is a Gluten-Free Industry Innovator when it comes to helping clients, the community, companies and client live a healthy and happy life. Visit her site at: thehealthyapple.com. So often I hear people asking how to make their own healthy, gluten-free snacks. The following nut cracker recipe is easy, inexpensive, and yes it's also healthy. Feel free to substitute the nuts and seeds listed below for other nuts or seeds of your preference. I always like to soak my nuts before using them; soaked nuts are much easier to digest. Preheat the oven at 360°F (180°C). Line two baking sheets with parchment papers. Grind nuts into a flour consistency in a blender or food processor (food processor usually works best). Add egg, water and sea salt and stir around with a wooden spoon until the mixture comes together in a quite stiff dough. Divide the dough into two and place them directly on the parchment papers. Roll them out to two rectangles, about 0-1 inches thick. If the dough sticks to the rolling pin you could roll it with parchment paper covering the dough. Use a knife to cut them in slices or squares. Spray some water on them and top with the seeds. Bake for about 10 minutes. Tip: Stay close and keep an eye on the oven, these crackers burn easily. Store them in jars or out in the open if you eat them within the first couple of days. This gluten-free recipe can be served with your favorite dip, or just eaten by itself! Pre-heat oven to 350 degrees F. Slice fennel bulb lengthwise to create disk-like slices. Prepare a baking sheet with parchment paper. Sprinkle with sea salt and minced garlic, then drizzle with fresh juice and vinegar. Top with orange zest and ground sunflower seeds. Bake for 30 minutes or until crispy. Celiac.com 08/12/2014 - Here’s another easy summertime drink that will turn a few heads. It blends watermelon with sweetened lime juice and crushed ice to deliver a refreshing burst of summer! Combine all ingredients in a blender and puree until smooth (add a few tablespoons of water, if necessary). Add lime juice to get desired sweetness. Transfer to a pitcher filled with ice and serve in tall glasses. For a grown-up version, add vodka to taste, as desired. Celiac.com 04/07/2015 - This dip is full of zesty bacon and cheese flavor that is sure to put smiles on the faces of your hungriest snackers. In a mixing bowl, whip the cream cheese with an electric mixer. Fold in and lightly mix the mayonnaise, Dijon mustard, horseradish, cheddar cheese, bacon and scallions. To heat, place in an oven proof container and bake at 400°F for 10 minutes or until bubbly and warm.